It's almost one year on from my last blog post regarding the Chance Brothers cataloguing project and I am pleased to report that the collection has created a great amount of interest over the past year. Sandwell Metropolitan Borough Council (SMBC) has been working in partnership with arts organisation Multistory on a project called Forging Links. It is part of a regional programme of work called New Ways of Curating, initiated and funded by MLA (Museums, Libraries and Archives Council) and ACE (Arts Council England). The focus of the project is on the heritage of the local metal bashing trades and industries and the communities that have been shaped by them. The archives of these important industries are held at CHAS and the project seeks to work with the local community to bring these collections to life by exhibiting photographs, stories and artwork in and based on these collections. 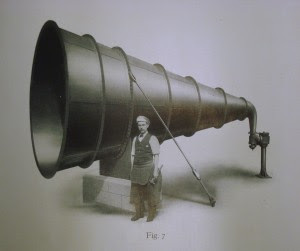 One of the most exciting pieces of artwork to come out of the project is a full scale foghorn, based on the photograph below of one of Chance's foghorns. The oral histories of local residents whose lives were touched by these industries will be broadcast live by the Sandwell Foghorn. The Foghorn was built by local Blacksmith Ian Moran in Cradley Heath and will be unveiled at the Queen's Square Shopping Centre in West Bromwich from 11.30am tomorrow as part of the Sandwell Arts Festival launch. So head down to West Brom to hear and take a look at this impressive structure! The project to catalogue the first third of the Chance Brothers collection officially came to an end in the last week of July. I feel privileged to have worked with the archives of such an important and underrated company and I am delighted that many of the key records are now finally accessible to the public. I had such a wonderful time working with my colleagues (Sarah, Mo, Richard, Sophie, Matt, Keith and Donna) at CHAS and I would like to thank them for all of the help and support they have given me over the past 12 months. I would also like to thank Alan Taylor, John Everall, Sue Wood, David Encill, Ray Drury and Philip Barnard for their interest and expertise where it has been needed and a big thank you goes out to Sir Jeremy, Toby, Sebastian and the rest of the Chance family for supporting this project from its start right through to its end. Although, despite the title of this post, I do not see this as the end. It is more the closing of the first chapter of the collection's life here at CHAS. The rest of the collection will be gradually catalogued over the coming years and I hope that the interest in the company will continue to grow as it has done during this project. If you are interested in accessing the catalogue it is now available to view online on the Black Country History Website at http://blackcountryhistory.org/collections/getrecord/GB146_BS6/. Please keep the history of this amazing company alive by visiting CHAS to take a look at the records yourself or by contacting the archive with your enquiries at archives_service@sandwell.gov.uk. Finally, I would like to say thank you to you....yes you, reading this post right now. Whether you became an official follower of this blog or just accessed it from time to time to read about my progress, I am extremely grateful for your interest and support. It has been a real challenge but I feel that you were there with me at every stage. Thank you for taking a Chance on me and my blog! The end of the project is edging ever closer. Goodbyes are always hard for me but the finishing line still seems so far away as there is lots more to do. I have five weeks left to try and finish the section of the catalogue I am working on and tie up any loose ends. A couple of weeks ago we had a visit from Sir Jeremy Chance, his son Sebastian and Sebastian's wife Vicky. They kindly treated Sarah (the Borough Archivist), David Encill (a Chance historian) and I to lunch to celebrate the end of the project. We were then joined by Alan Taylor and his wife Joyce back at the archive to take a look at my work and some of the interesting items amongst the collection. I was then presented with some beautiful fiestaware plates from the Chance family. The plates are a bright royal blue with a gold gilt spirograph design. David Encill, an expert on Chance's domestic glassware later informed me that the pattern, which looks very similar to a popular pattern called Greco, is in fact a far more rare pattern known as Roset that seems to have been a prototype produced for publicity shots and may never have been released commercially. I was surprised and extremely touched to be given these plates and they will always remind me of the great time I've had on this project. Me, Alan Taylor and all those boxes! And now it's back to work. I have moved on to cataloguing the sales and marketing records of the company, which are always very exciting. They include the order books, catalogues, price lists, illustrations, photographs and records regarding visits, exhibitions and centenary celebrations. I think I have saved the best for last. Following my last post, I am pleased to announce that Sylvia Brookes kindly forwarded copies of her wedding photos to me. If you remember, Sylvia and her friend Margaret worked for Chances and Margaret made Sylvia's wedding dress. As you can see, Sylvia looked beautiful on her special day and her dress is a symbol of the close bonds and friendships that were often forged at the works. During the course of this project I have enjoyed nothing more than meeting Chances' ex-employees. Their stories are so real and vivid and they have given me a much more rounded view of the company than just the records could ever provide on their own. Having said that, I did have quite an exciting surprise looking through the records last week. Hidden amongst piles of papers and wrapped in a crinkled old paper bag was nothing more than a...knuckleduster! Tied to the knuckleduster with a piece of pink string was a very small note dated June 27 1867, which reads, 'This was found among Mr Henderson's papers - it was made for him at the works'. Not only was the knuckleduster itself a strange and unusual find, it was was made even more exciting by the confirmation that it belonged to the lighthouse draughtsmen who had been sacked by Chances for posting an unflattering notice about another colleague through the gatehouse door following a heated argument. I described this incident in more detail in an earlier post called 'Hell hath no fury like an employee scorned'. I hope that the pair never came to blows! Over the past couple of weeks I have given two talks about Chances. The first was at Thimblemill Library during a coffee morning. The morning was very informal and I had a really enjoyable time meeting the regulars and answering questions as I went through the talk. I met some very interesting people including a lady called Sylvia who used to work in the Vello tube making department. She told me some very interesting stories about the people who worked there. There was Joy who did Diana Ross and Tina Turner impressions around the works and Margaret who was a close friend of Sylvia's and made her wedding dress. It just goes to show that long lasting friendships were forged at Chances. Sylvia described her wedding dress to me and it sounds beautiful. She said that she would forward a picture of it to me so watch this space in case it arrives. The second talk I gave was at a day school at the University of Birmingham regarding glassmakers in the West Midlands. I was one of four speakers and each speaker had a very different facet of the industry to talk about. Jennifer Davies talked about the rise and fall of the Stourbridge glass industry and gave us an idea of the very interesting work happening at Broadfield House Glass Museum. Sally Hoban introduced us to the famous stained glass artists who worked across the region and described the way that artists were trained at the Birmingham Municipal School of Arts. And Karamdeep Sahota, a project archivist, introduced us to the fascinating records of the Hardman collection at Birmingham City Archives. The four talks that were given and the discussions that followed provided a very broad and varied sweep of the industry across the Midlands and it was an extremely stimulating day, culminating in questions about the future of the glass industry. It seems that whilst the times of large mass-producing glass companies is over, there are many successful individual artists still operating across the region and their more bespoke work offers a view of what the future holds. To get a sense of this future I would advise you to visit Broadfield House Glass Museum to see some of the more contemporary work on display and I was also informed about the International Festival of Glass 2010, which runs from 27 to 30 August at Stourbridge. There will be events, exhibitions, displays and workshops including opportunities to have a go at glass blowing and glass bead making. For more information, check out the website at http://www.ifg.org.uk/. It has been quite a serious time on the project for the past couple of weeks. I am still ploughing through the company's financial records and I have managed to draft my colleague Matt in to catalogue the patents that I mentioned last week. Financial and legal records can be quite dry and formulaic so I had no expectation of being able to report any quirky and interesting finds amongst these records, until Matt came across a very interesting patent a few days ago. Most of the patents we have come across so far have been fairly standard and representative of inventions you expect to be associated with a glass firm, such as 'Improvements in the the manufacture of pipes or tubes of glass', 'Improvements relating to optical glass' and the obvious (if unhelpful) 'Improvements in the manufacture of glass'. 1) Elephant dung is a renewable resource, unlike wood pulp. 2) It is a free waste product, therefore, good for business. 3) It is often produced in countries where elephants are deemed an agricultural pest, such as Thailand and Sri Lanka, enabling locals to see the animals as assets and not liabilities. Whether Chances were aware of the eco-friendly benefits of using dung for paper or not, it does retrospectively appear to be a very good idea. And whilst Henrick Zander admits in his specification that he is not the first to produce paper from 'vegetable matter' (this invention can probably be assigned to the Egyptians), he does believe that he is the first to use horse dung in the production of paper. In years to come, when it is possible that we may all be taking notes in our dung paper notebooks, we can look back and be grateful to Henrick Zander: (possibly) the first inventor of horse dung paper. The records testify to this desire to create new products and improve on others. There are mixture books and reports recording experiments in the laboratory for producing the perfect coloured and textured glass. There are also over 150 patents in the collection for inventions and improvements to glass making processes granted to Chance and its employees. Amongst these are around 20 original letters patents dating from 1842 to 1860 with their original seals and boxes. Letters patents are a legal instrument in the form of an open letter issued by a monarch or government, granting an office, right, monopoly, title, or status to a person or to some entity such as a corporation. These documents are very large and beautifully illustrated with a large decorative seal attached (please see below). A particular form of letters patent has evolved into the modern patent granting exclusive rights in an invention. It is also clear from the records that Chances could be ruthless when it came to gaining the trade secrets of other firms. In 1887, Chance director Kenneth Alan Macaulay corresponded with an agent in Belgium called Achille Charlot who had found an ex-employee of a glass manufacturer called Baudoux who would sell their knowledge on how to re-produce Baudoux's ruby glass. Initially, the ex-employee wanted £120 but Charlot managed to bring his price down to £70. This equates to approximately £4,000 in today's money. A bargain for a trade secret, I'm sure you will agree!